I had the honor of meeting one of the most dynamic and energetic women I have ever come in contact with. Her name is Kathy Peel and she is THE Family Manager. 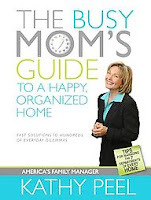 Her site, FamilyManager.com highlights her skills and life calling to help families get better organized. You can check out some of her wonderful resources for FREE Here: a FREE Grocery List, a FREE Meal Planner, and other Resources for Your Success. You can also read some grocery shopping tips she gives in AOL Parentdish Here. I am going to have to adopt some of these great ideas myself! Don’t forget I will be on the Dr. Phil Show Monday! Look Here for your local listing. You can actually see a preview of the show for Monday Here and read a synopsis Here. 1) I am flying back from the Dr. Phil show. I have been out in LA for the past 3 days filming. I must say he has a wonderful staff and he is an amazing person. I was very impressed with it all. It was a pleasure and honor to be on his show. The show airs on Monday, March 2nd. Look here for your local listing. 2) I now have got a dot com. You can now read Frugal Coupon Mom at http://www.frugalcouponmom.com/! Welcome WTXL viewers. All I can say is that it is “absolutely” (heard 100xs by myself on today’s news segment) hard being on television. Special thanks to Lauren Dorsett and the crew at WTXL. They do that difficult job every day! I hope you are able to find some useful information on here. I created this website to share my knowledge with other families who can benefit from my savings tips…because who cannot afford to save some money in this day and age?